It’s early October, and I’m at the High Plains Book Festival at the art museum in Billings, Montana, selling books as fast as I can handle the slippery credit-card reader. My own books are on the table with those of other regional authors and friends. Stacks of books pass to people I’ve known for years. Everyone involved is smiling, giddy to see books selling like — well, like books — in downtown Billings. In the last six months, several hundred locals and more distant friends have bought $100 shares, or made larger investments, to become co-owners of This House of Books, our new indie bookstore. Author-owners include Craig Johnson of Longmire fame, and Jamie Ford, author of the bestseller The Hotel on the Corner of Bitter and Sweet. Back in 2011 and 2012, Billings lost its Borders, and then, more painfully, Thomas Books, the locally owned downtown bookstore we’d loved for 20 years. Many of us felt as if we’d somehow failed our bookstores, but both stores were profitable. What killed them was the corporate bookselling model, which demands ever-higher profits, and the exhausting burden of running a sole-proprietor shop. There are still a few niche and used bookstores in town that serve their purposes wonderfully. We have Barnes & Noble and Costco and Target, but to anyone who values a bookstore as an expression of a town’s soul — full of books chosen by a bookseller we know — they are no substitute. People browse the books and board games at This House of Books in Billings, Montana. Writers and readers got together and moped into our beer about this sad development. We felt like a house without a cat or dog; how could we claim title to being the lively literary community we knew we were? And yet there were encouraging signs: Around this time, voters approved funding for a new downtown library, the book festival began taking off, and suddenly, we had enough local authors for a good-sized party. All we needed was a bookstore. If you’ve never experienced the way a great bookstore can accelerate time, so that two hours have passed and you’re sitting on the floor with books in your lap wondering what happened, you might find it hard to understand how we felt. But a lot of us need to get lost in rows of new books. We need to hear authors read and speak, and we love to talk about ideas. For a year or so, all we did was mutter and complain. No one was eager to throw down a life’s savings and give up all semblance of a normal life to start a bookstore. In some places, this might have been the end of it, but you have to remember where we live. Billings made national headlines in the 1990s for its vigorous pushback against hate groups and white supremacists. This is not a community that walks away from existential challenges — the “Not In Our Town” movement started here. At some point, former Billings Mayor Chuck Tooley, of the Not In Our Town era, wondered aloud if a cooperative would work. Someone Googled it. Co-ops are special beasts. There are cooperatives for farmers selling grain and co-ops that sell electricity to rural residents. There are also retail varieties, such as food co-ops. Montana has a robust cooperative movement with staff to support new co-ops, so we kept researching. So why can’t bookstores be co-ops? Actually they already exist, with the Harvard Co-op Bookstore being one of the best known. The key is common ownership. 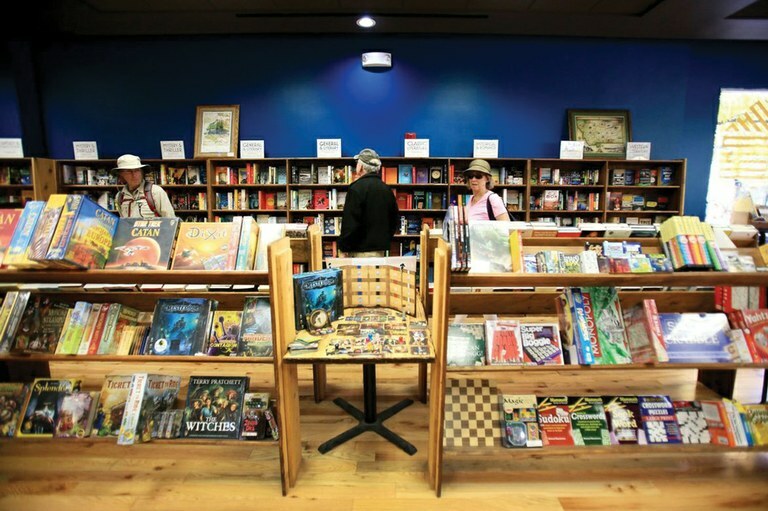 When we made a decision to form what we called the Billings Bookstore Cooperative, we gambled that Billings would be willing to spend money, not just on books, but on owning a little piece of a bookstore, in exchange for discounts and dividends. Oh, the magic of being right, as townspeople stepped up. So began the slow-motion movement that led to This House of Books opening its doors in October 2016. Volunteers wrote a business plan, formed the cooperative, began selling shares and hired a general manager. We had good advice from booksellers around Montana, and member-owners volunteered hundreds of hours building out the 3,000 square-foot space. In a critical step toward sustainability, staffers are now paid for their work. The bookstore features cushy chairs, a tea bar and good lighting, and member-picked books line the shelves — my definition of paradise. This is a happy story, not just for Billings, but also for brick-and-mortar bookstores in general. In the wake of the Amazon and e-book revolutions, people have begun seeking a more personal experience, a trend that is reshaping the marketplace. The secret sauce is a bookstore that answers only to its community. It refreshes the human spirit in a fundamental way. This House of Books is that kind of gift, from the people to the people. Carrie La Seur is a contributor to Writers on the Range, the opinion service of High Country News. She is a writer in Billings, Montana.